Kind, extremely helpful staff. Thryel took care of everything - car rental, cab to and from the airport and having someone take our bags to and from the hotel. Clean comfortable suite in a beautiful hotel in a fabulous location. The breakfast was fantastic. Perfect location and a good value for your money, beds and bedding a bit dated and overall could improve furniture in the rooms. The pool and breakfast were great, the staff was lovely and you were right in the center of town within a minute of all the restaurants and shops. The room I asked for was reserved for me. Someone helped us with our luggage to the hotel and back to the bus station. The location is great. It’s in the city center close to all main attractions. The hotel has a really nice pool and there is a sunset terrace where you can view the beautiful sunset comfortably. Staff is very friendly and accommodating. Views are amazing, location was great, property is authentic and quiet and clean. The location was wonderful. The suite was charming with a beautiful view of the Oia sunset. And the staff was exceptional. The large courtyard, pool area, and rooftop patio with views of both sides of the island made this property a quiet oasis in the middle of a town that's otherwise overrun with tourists in the summer. We were so glad to be able to retreat here and have a little bit of elbow room, which wouldn't have been possible at many, more expensive other hotels that lack the generous outdoor areas. The rooms were also spacious and clean. 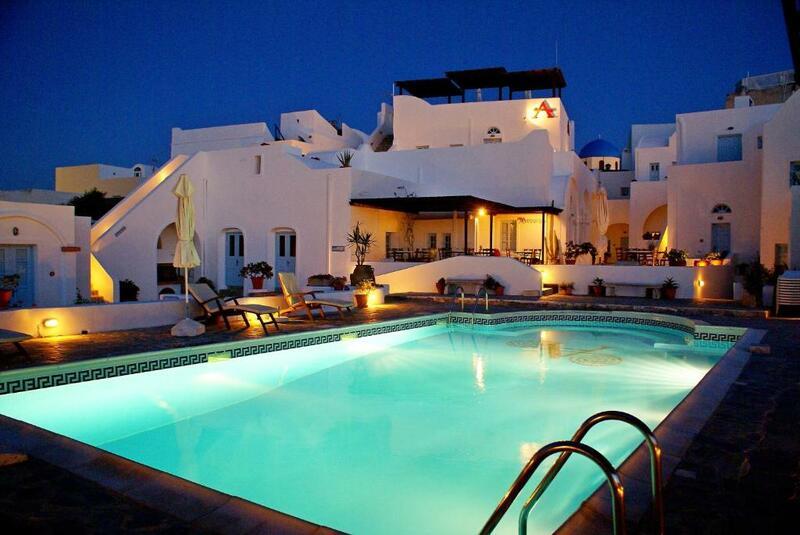 The hotel is right in the center of Oia but the pool area is so relaxing and quiet . 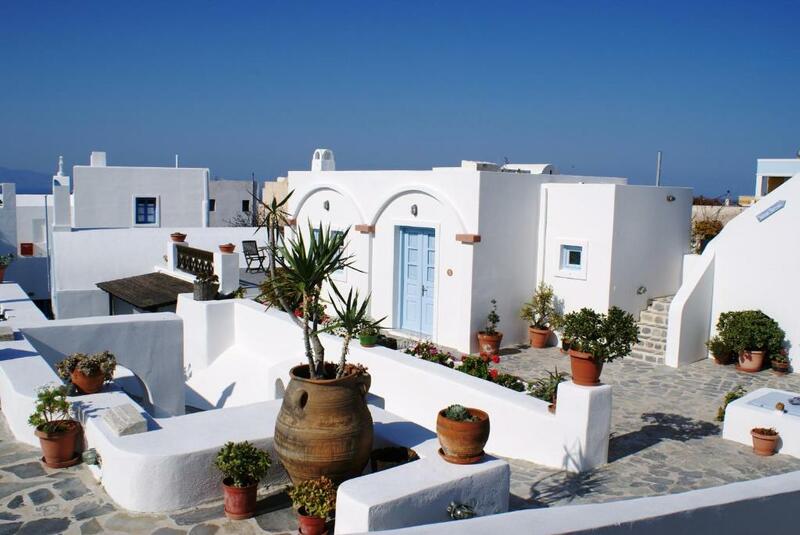 Wonderful location with a roof top deck to view the splendid sunset without the crowds! The pool is refreshing and a must for a cool down during the hot, humid, sunny Thira Days! The Location is prime for getting anywhere in Oia, parking is hectic but free in several lots within a short walk from hotel. Definitely setup assistance from the bell hop/pool boy if you have luggage, the walk to the hotel is up hill across cobble stone walkways. Lovely breakfast with outside café dining area. The host was so helpful giving us all the info we needed to ensure our stay and adventures were the best. Great location, very beautiful hotel and pool! Great helpull staff! Lock in a great price for Aethrio – rated 9.1 by recent guests! 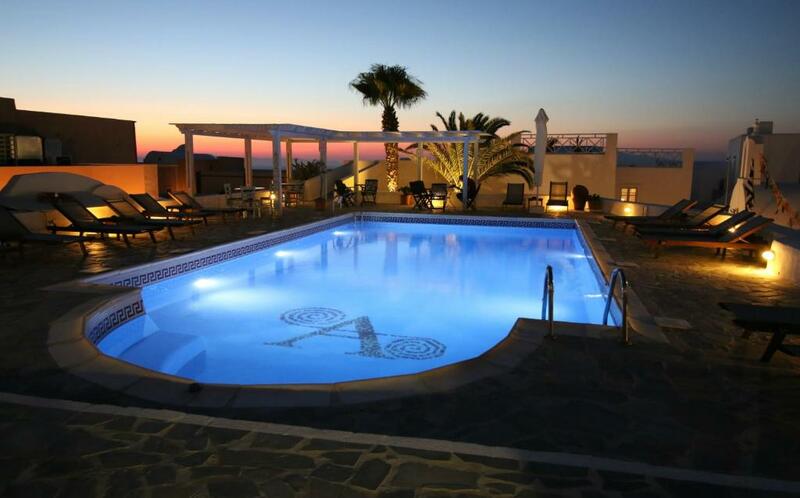 One of our top picks in Oia.Ideally located in the heart of Oia, Aethrio Hotel features spacious rooms and apartments with sunset views. Aethrio has studios, apartments and superior rooms constructed according to the Cycladic architecture, enjoying modern facilities and comforts. All accommodations feature a balcony and private bathroom. Aethrio provides guests with a large swimming pool, a breakfast room and a lounge area with satellite TV. 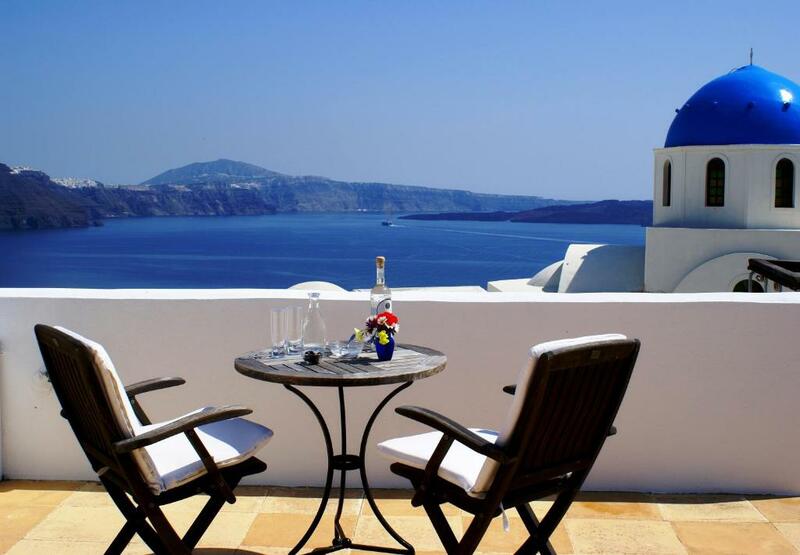 The rooftop terrace is the perfect place to relax and soak up the Santorini sun and take in the stunning sea views. The main square with its many shops, restaurants and bars is just steps from Aethrio Hotel. When would you like to stay at Aethrio? Traditionally decorated, this apartment features a kitchenette and fridge. 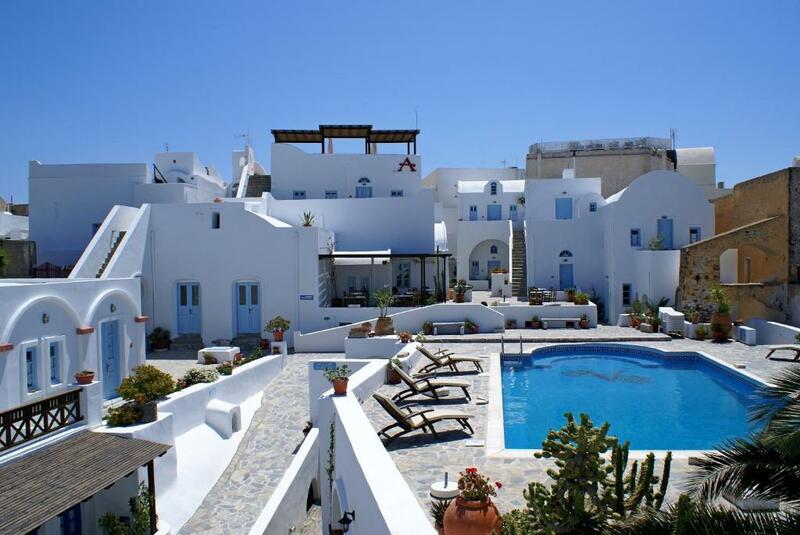 It opens to a private terrace or balcony with views of the pool or main hotel or village. This studio features a kitchenette with fridge and a terrace or balcony with views of the pool, the property's courtyard or the village. Includes a fridge, satellite TV and private terrace or balcony with pool or main hotel view. Features marble floor and has either a spacious bedroom with living room or a second loft bedroom, fully fitted marble bathroom with hairdryer, private balcony with sea or pool view. Features marble floor and has a spacious bedroom for 2 people and a second bedroom in a mezzanine, fully fitted marble bathroom with hairdryer, semi-private terrace (access by mezzanine) with sea view and partial view of the Caldera. Opening to a terrace or balcony with village views, this air-conditioned apartment includes a satellite, flat-screen TV, a kitchenette with cooking hobs and a fridge. House Rules Aethrio takes special requests – add in the next step! Aethrio accepts these cards and reserves the right to temporarily hold an amount prior to arrival. Please inform Aethrio of your expected arrival time in advance. You can use the Special Requests box when booking, or contact the property directly using the contact details in your confirmation. The staff at Aethrio are wonderful, from the reception staff to the cleaning staff, the technician and the lady from Thessaloniki who organises the breakfast. The hotel itself comprises a series of buildings with a lot of character. Our room had very comfortable beds and lovely furniture. It was kept very clean and had a terrace with a view to die for. The whole complex is a calming oasis in a busy, but very beautiful, town. The pool area is great and reasonably priced good food and drinks can be purchased from reception. The location is ideal with great restaurants nearby (particularly liked Karma) and the bus station about 5 minutes walk away. Can also recommend the walk to Fira, somewhat strenuous in parts, but worth it for the views. Breakfast and check out time start at 8.30 am, a bit late for morning travellers. Nice apartment with 2 bedrooms. Privacy. Close to Oia landmark. Central location. Great pool. Great staff. The shower curtain should be longer so that the water would not spill out all over the toilet. Can't think of anything, it suited our needs and preferences perfectly. No bad experiences at all. The service, location, decor, facilities, food, staff were all excellent! All the photos posted on this site is accurate - the real life vibe makes it even better though. Absolutely loved the fact that it felt like its own little village inside the village of Oia, a sanctuary right in the middle of the town. The pool was awesome. Being woken by the church bells next door on Sunday morning was a unique treat. Host was amazingly helpful and even carried our bags to the room. We got welcome drinks and some breakfast the night before, as we were leaving very early. Sea view from the room and private balcony was spectacular!! Spacious and accommodation in a central location. The furnishings in our hotel room are a bit outdated. There is a sewage smell in our room. Beds and bedding could be much more Comfortable, sun deck seating is minimal and could use comfortable seating. Wish we had better access to ice and glasses. Our room smelt like an open sewer. We paid extra for the superior room and they said “if you wanted something nice, you should have stayed in a different hotel”. The shower overflowed and we had to lay towels down all over the floor so we didn’t slip on the marble (see photos). Outside our room there were broken pieces of wall, a leaking air conditioner and rubbish (see photo). When we complained about these safety risks, they laughed at us and said it was our fault for booking this room and totally disregarded our concerns. The people running the hotel are so rude and we have never received such terrible customer service. Do not spend your money here. Do not stay here. The magic of Santorini is lost when you cannot even stay in your hotel room for more than 5 minutes due to the smell of sewerage. They told us everywhere in Santorini smelt like this however we went to multiple other hotels and villas that did not have this issue. They did absolutely nothing to help solve these problems, except defend themselves and say that we should not have expected a quality hotel. They suggested to us that we move to a €2000 a night room in another hotel if we wanted a comfortable place. After we complained, they left a FULL GARBAGE BAG out the front of our hotel room door (see photo). The sewerage smell and garbage bag attracted so many bugs and made it even more unpleasant to return to our room. Stay here at your own risk! Location was good if you like places overrun by tourists.